When Wil disappeared into another dimension at the end of the Celestine Prophecy, one wondered if he would come back for The Tenth Insight. He did and brought back with him instructions for bridging the two dimension of his travels. These dimensions the author calls the Physical and the Afterlife dimensions. Why the term afterlife? I wonder. Spiritual would work just as well as an adjective for dimension, without the paradoxical aspects of a phrase which refers to a life after life ends. I prefer the approach of Rudolf Steiner, who is a scientist not a novelist. Steiner posits a physical and a spiritual dimension to our life while in our physical body and a spiritual dimension thereafter. Steiner develops a spiritual science of many dimensions, however, and Redfield tantalizes us with hints of the spiritual dimension in his two dimensional approach. Our nameless hero of Redfield’s novel meets Wil, Charlene, and other like-minded companions in an Appalachian valley to confront some vague new energy machine that is, even more vaguely, threatening the world. By moving back and forth between two lifetimes and between the two dimensions, Wil’s group finally flushes the energy machine experimenters out of hiding and chases them from the forest, but not before some innocent trees have been wantonly sacrificed in the process. How the group does this is the essence of the book. First they encounter themselves as military officers and Native Americans in a previous century. Back in the valley they are unable to proceed against the evil energy guys until they clear up their emotions about each other that have carried over from their previous lifetime. Cooperating finally as an actualized Eighth Insight group, they each remember their Birth Vision and recall what their individual Life Mission is. The final step for the group is to remember the World Vision, hold on to it, and project it onto the evil experimenters. When they are unsuccessful at this endeavor, David arrives to remind them to “feed no evil” by attempting to remove the experimenters. They pray together in Tenth Insight fashion to remember the leader Feyman’s Birth Vision and World Vision. Once they get a set of visions from him that coincide with their own, they pray to include him in their group. This scares the pants off Feyman, who loses his resolve to eradicate the prayer group and leaves with his group of energy experimenters to parts unknown, leaving behind a wake of fissures in the earth and innocent fallen trees. Overall this story is a Hollywood version of spiritual life reminiscent of the movies Howard the Duck, Brainstorm, and Star Gate. Humans move back and forth between two dimensions to save the world. 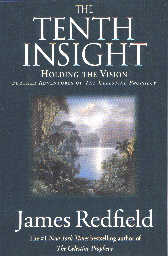 Redfield’s World Vision has glimpses of volitional credibility, but it is so hindered by his obvious socialistic blinders that one wonders if he really appreciates the good intentions (Birth Vision) of free market capitalism as much as he appreciates the good intentions of his own Birth Vision. As a bridge for the democratic socialists that fill our Congress and labor unions to cross over into the freedom of a volitional natural society, this story will be useful because Redfield provides a recipe for creating any new reality, even one without coercion.